Please note that Mystic Monday Card Readings will be changing after September 15th. The 3 card spread you are used to seeing each week will soon be a featured item on the upcoming monthly newsletter “The Mystic Muse”. Going forward, Mystic Monday readings in the blog will consist of a single card with thoughts for that week around that pulled card beyond what is available in the guidebook. Register on the website to receive this information filled newsletter. All new mailing list registrants by September 15th will receive a private card reading by Colette via email or in person. 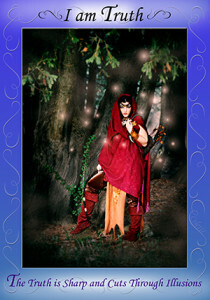 Today we see a series of cards that speaks to me of action due to the unifying theme of the colour red. As a hot and vibrant colour red always gets me feeling energized. This card has come up often this summer for Mystic Monday and seems fitting yet again as we come to the end of August and face September and the coming new season because even if things change it really is up to us how we respond to this change. At this time we can be poised towards action if we choose it. We have the option of pulling inwards or expanding towards what is potentially out there for us. Action is asked of us and the action taken can be a physical step or simply a decision to heal aspect of ourselves that hold us back. That is the beauty of free will and choice. Therein lies the gift of being in this human existence. Having this card as the second card for this spread right after choice speaks to me about the importance of being true to yourself and your dreams when making choices. As I ponder on the red theme in this spread it brings to my mind to speak about being true in your actions as well as your choices. Truth, in all situations, will conquer fear and give bolster resolve. Before I complete the notes on this card for this week I wish to mention that what stands out for me today is the fact that in this card the figure is about to step into her truth and by which she plans on taking action. What project or plan are you just about to take action on? Whatever that is there seems to be indication through this spread that you are heading towards some measure of success. Abundance is not always about financial gain but of course that is the common one to assume when this card shows itself in a reading. Given the other two cards this week I would think that the abundance spoke of here is of riches that out-weight money in many ways. Abundance of freedom of spirit for some reason comes to my mind. With choices based in your personal truth you will access an abundance of happiness as long as you act on those choices and take the steps needed. Register to my mailing list to continue receiving 3 cards card readings each month along with other exciting Mystic and Creativity Coach features.